Posted June 24, 2013, in Alumni News, We R Arts and Sciences Student Spotlight. Rutgers-Camden can claim many accomplished graduates. Our students go on to pursue successful careers in all fields. Kelvin Jeremiah, who earned his master’s degree in history from the Graduate School-Camden in 1997, has continued Rutgers-Camden’s tradition of accomplishment. 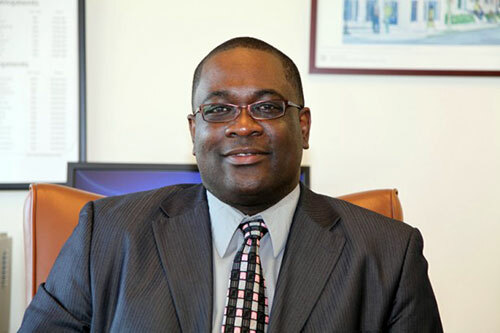 In March 2013, Kelvin was named President and Chief Executive Officer of the Philadelphia Housing Authority (PHA) after serving as Interim Executive Director and Administrative Receiver since June 2012. Kelvin’s work in the field of affordable housing began because of his desire to make a real and meaningful difference in people’s lives. His work with the PHA “can be transformative,” he says. “It’s why I got involved.” The PHA provides housing and support services to over 80,000 residents in Philadelphia. It is a service that is desperately needed, considering the large percentage of Philadelphians that live in poverty. Kelvin’s time at the PHA has been dedicated to making sure that housing for those in need is provided in the most ethical way. Kelvin came to the PHA in August 2011 as the organization’s first Director of Audit and Compliance. In this role, he was tasked with rebuilding the agency and complying with all regulations. During his time in this position, he saved tens of millions of dollars, all of which was earmarked to serve its residents. In April 2013, the agency was returned to local control, an accomplishment of which Kelvin is very proud and a highlight in his career at the PHA. Besides the PHA, Kelvin also worked for the New York City Housing Authority, where he served as the Inspector General, and at the Springfield Housing Authority in Springfield, Massachusetts, where he was Deputy Director. Kelvin’s interest in social justice was shaped at Rutgers-Camden, where he obtained a master’s degree in history. His love of history stems from his upbringing, when his great-grandmother would share her past experiences. Kelvin was struck by the importance of this oral history, and thirsted to know more. At age twelve, he immigrated with his family to the United States from Grenada, and settled in New York City. While in the United States, he noticed that while written history was abundant, oral history, especially that of African-Americans, was largely absent. He felt a responsibility to those who had come before, and decided to pursue history academically. Though he has already achieved so much with the PHA, Kelvin still has many goals which he plans to meet, including changing the culture of excessive spending and restoring the region’s trust and confidence in the PHA. He wants to collaborate with other institutions, such as universities, leveraging resources and really “push the boundaries of what we do.” Kelvin credits Rutgers-Camden with “shaping and expanding my world view, and how I live my life.” Truly, Kelvin’s life so far is an example of a life well lived. Rutgers-Camden is very proud to count him as one of our loyal alumni. Page last updated by Faculty of Arts and Sciences at 11:59 am October 25, 2017 . This page was printed from http://fas.camden.rutgers.edu/2013/06/24/kelvin-jeremiah/ at 1:35 AM Monday, April 22, 2019.